To inform our customers that the current policy of the store, seeking the best benefit for both parties will only be allowed to return and / or cancellation of purchase before sending the code VOUCHER or login information and password. If these data have already been issued, you can not exchange or return the products. As this is a product exclusively online, it is impossible due to the characteristics of the product. 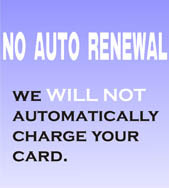 For some payment modes refund is not possible.